While some castles are knight's manors, not all knight's manors are called castles. 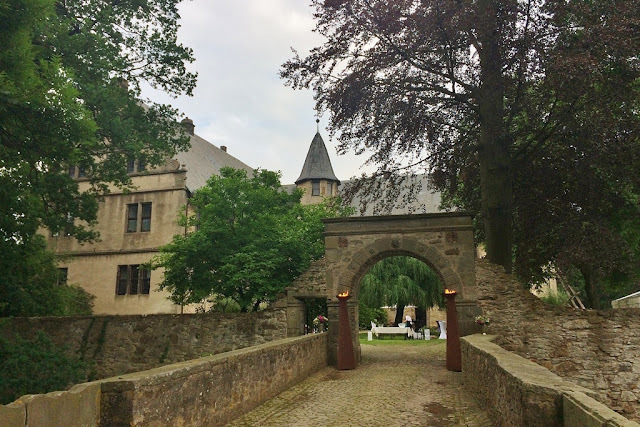 Schloss Haddenhausen near Minden falls into the former category and it sometimes also referred to as Rittergut Haddenhausen, but as I'm a Castleholic and not a manorholic we will conveniently go with the name that includes Schloss. The origins of of this knight's estate today owned by the Barons of Bussche-Haddenhausen date back a good 800 years. Haddenhausen was firstly mentioned in 1254, when the Bishop of Minden purchased the estate. In 1385, it was given as a fiefdom by Bishop Gerhard II of Minden to Ludolf von Mönnichhausen, an ancestor of that Münchhausen who became famous as the Baron of Lies. Almost 100 years later, the estate was largely destroyed during a feud between the Bishops of Minden and neighbouring Osnabrück. It was later rebuilt by the Münchhausen family who, in the meantime, had became the manor's owner. During the Reformation, key members of the Münchhausen family (violently) advocated for Catholicism over Luther's teachings that had recently reached Minden. As a consequence, the estate was heavily damaged once again and while the family remained its owners, they made Courland their home for a number of years. After a long dispute over the ownership and the disorganisation of the financial circumstances, the estate was sold in 1610 by Hilmar the Younger of Münchhausen, as guardian for his nephew, to his son-in-law, Johann of Bussche-Lohe. 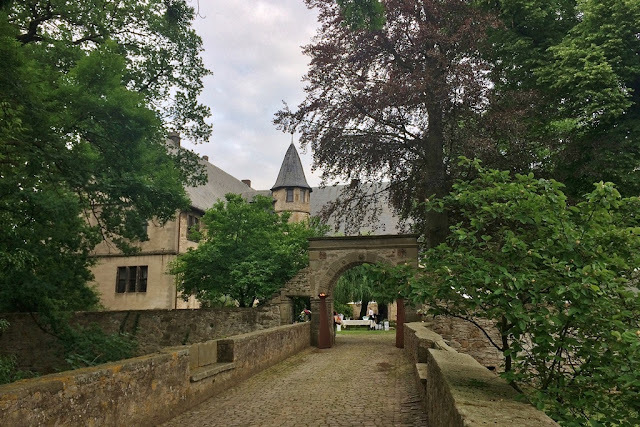 With Haddenhausen's new owner began the history of the Schloss's current appearance. Johann and his wife Hedwig commissioned architect Eberhard Wilkening, who had also built the Pied Piper's House in Hamelin, to draw up plans for a castle to accomodate their family. Like so many other castles in the area, the Schloss was built in the local Renaissance style, known as Weser-Renaissance after a nearby river. The two-winged castle with its distinctive tower was built between 1613 and 1616. Gradually the Bussche-Lohes became known as the Bussche-Haddenhausens. (And if you think you know that name but can't place it: The paternal grandmother of King Willem-Alexander of the Netherlands was born a Baroness of Bussche-Haddenhausen.) Already in 1708, the castle was put into a family foundation, the Bussche-Hünnefelder Stammlegat, and thus passed through the generations to this day. 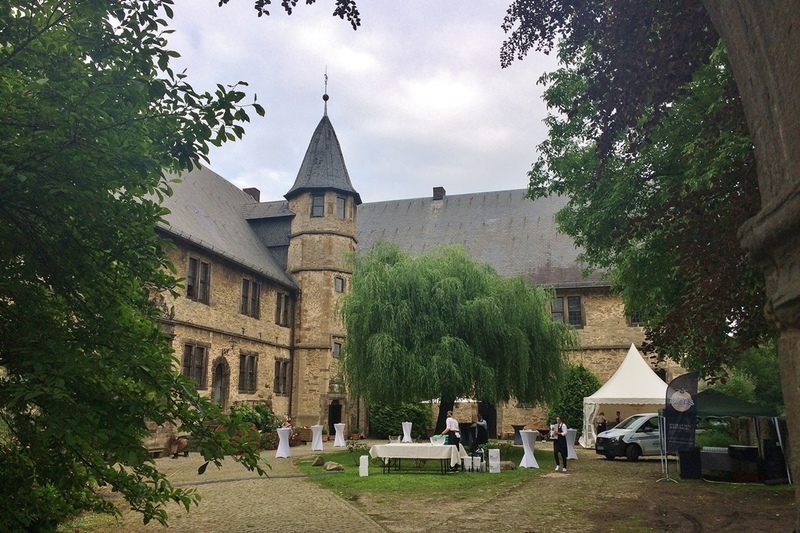 Schloss Haddenhausen isn't generally open to the public with the exception of the European Heritage Days in September each year when the owners give tours of the estate.